Solving puzzles is an excellent way of improving one's tactical powers, and for this reason puzzle books have always been popular. This new work seems likely to continue that trend, and it is unlikely that even experienced readers will have seen more than, at most, 10% of Emms' 1000 puzzles before. Throughout this work the puzzles, grouped into 11 chapters, get progressively harder, starting with simple one and two movers for beginners (difficulty level 1) and ending up with 'the ultimate challenge' (difficulty level 5 and above). Emms claims that some positions in this final chapter will 'tax even the strongest grandmaster', and after spending over thirty minutes to solve some of them, your reviewer (of 2300 strength) agrees that this is very likely. Throughout this work there are three test chapters, each containing five tests. Each test contains 16 puzzles, ranging from the very easy to the incredibly hard, and a table will convert your score into a rating. This is a good feature and helps to show how one is improving, although of course the whole book should really be used as a challenge. Each non-test chapter meanwhile sees the first lot of many puzzles being introduced with text. It's surprising that the positions with no comments below them are often harder to solve than those that do have. Particularly enjoyable is the chapter entitled 'find the wrong move' where readers have to find a plausible, but in fact awful, move and hopefully this will help to cure 'blunderitis'. Emms' use of original games cannot be questioned as he has made extensive use of his own unpublished games and has then ploughed through TWICs from the past two years to find recent puzzles. He also includes a chapter featuring puzzles from the super strong Soviet Championships of 1947-67, of which nearly all will not be known to readers. As usual Emms also writes clearly and concisely, both when giving a glossary of terms relating to puzzles at the beginning of the work, and when introducing each puzzle. 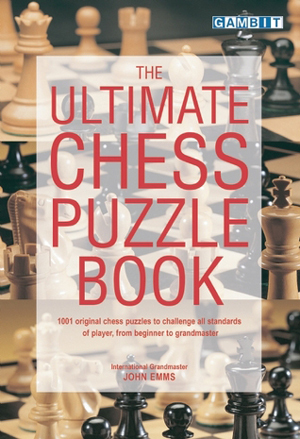 His solutions are also thorough and leave readers in little doubt as to what the complete solution is.For all who want an enjoyable challenge which will improve their tactical ability and chess judgement by solving 1001 puzzles (well there are really just 1000 with no.1001 displaying Emms' dry sense of humour) this work is highly recommended.